More top MTB trails covers the best trails, routes and rides in the Free State, Gauteng, Kwazulu-Natal, Limpopo, Mpumalanga & North West Provinces. Up-to-date route info, great photographs and excellent detailed maps, along with Imba trail. Difficulty rating system and African Mountain Bike Association approvals makes this book the perfect companion for experienced as well as aspiring mountain biking enthusiasts. A comprehensive list of trails to explore in the other 3 provinces, as well as in Botswana, Lesotho and Swaziland, can also be found. So, get on your bike and ride! 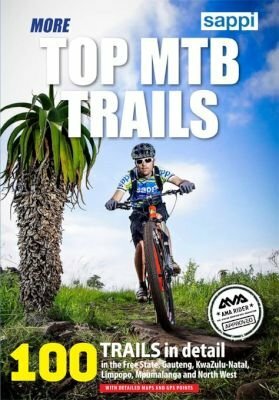 Top SA MTB regions (Free State, Gauteng, Kwazulu-Natal, Limpopo, Mpumalanga & North West Provinces); Age group: all (sport, race, touring & recreational riders); African MTB association [AMA] accreditation; Overview of trails & regional intros; Maps highlighting trails. Trails: Top, other and minor trails; Tip box for each top trail; Grading (easy to advanced); Duration Configuration; Start point & GPS coordinates; Terrain (jeep track, single track); Cell reception; Requirements & facilities.